IN-FORM mare Major Occasion will have her last local start on Saturday night before embarking on an interstate campaign. Scheduled for a trip to Victoria, Major Occasion will round out her preparation in the Ranji Bill Stake at Tabcorp Park Menangle. Although the daughter of Art Major has drawn wide in the Group Three, trainer Chris Frisby is confident Major Occasion can head south on a winning note. Major Occasion boasts four victories from her last five starts, with her defeat a gallant second in last month’s Ladyship Mile. The four-year-old’s trek over the Murray River is to tackle Victoria’s unofficial Mares’ Triple Crown which begins with The Make Mine Cullen in Melton on May 4. “This will be her last outing before heading to Melbourne,” Frisby said. “She has had some hard racing from bad draws at Menangle, so I will freshen her up after this weekend before we go. 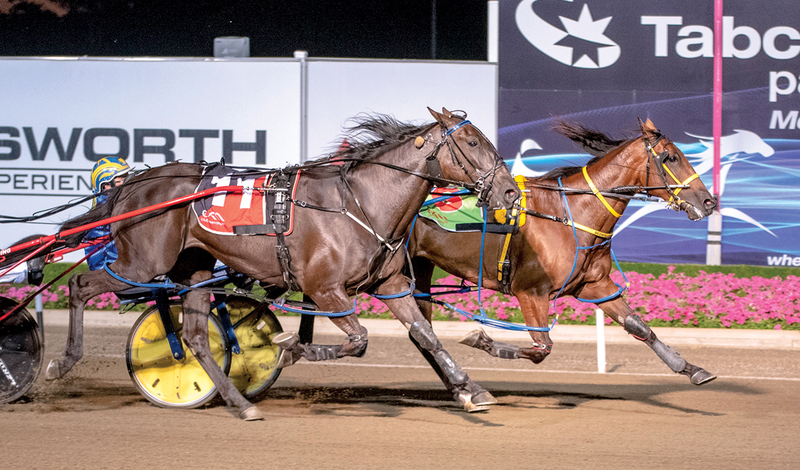 With the Vicbred Super Series in July part of Major Occasion’s long term agenda, Frisby revealed he is keen to take the Australian Pacing Gold purchase across the Tasman in June. “If she gets an invite to the New Zealand Harness Jewels we will go over,” Frisby said. “She will then head back to Melbourne for the Vicbred which will see out her season.